The World No-Tobacco Day (WNTD) is held on every May 31 by the World Health Organisa>on (WHO) in order to remind the world the dangers of tobacco in order to reduce its usage. It will be open for submission from all members of AMSA-Interna>onal with the theme of â&#x20AC;&#x153;Recognising New Strategies to Reduce Tobacco Usage as a Step Towards a Tobacco-Free Community.â&#x20AC;? Every year worldwide, tobacco usage have caused 5.4 million people to lose their lives. One of the most terrifying horrors in tobacco usage is what is called as Second-Hand Smoking (SHS), which is when an individual breathes the smoke of othersâ&#x20AC;&#x2122; cigar. SHS causes the same effect of tobacco as it does on the smoker, which means that tobacco usage would not only endanger oneâ&#x20AC;&#x2122;s health, but also those around it, with children as the main victims. Around 700 million children in the world has inhaled tobacco, and due to their still weak immune system, they became more prone to its side effects. Through this competition, AMSA International aims to increase awareness and knowledge regarding tobacco usage, with hopes that it will increase the ability of its participants on reducing the amount of tobacco user in their own society. The Asia Pacific region is the home of 30% of the worldâ&#x20AC;&#x2122;s tobacco users, and 80% of those come from developing countries. It is also a dangerous habit, as it is one of the major factors of noncommunicable diseases (NCDs). 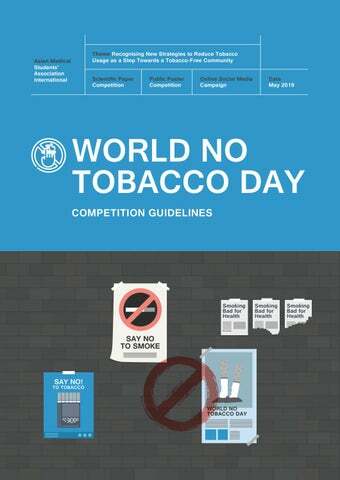 GENERAL GUIDELINE AMSA Interna_onal World No Tobacco Day Compe__on consists of three categories: 1. Scien_ﬁc Essay 2. Public Poster 3. Online Social Campaign Compe__on Submission for this compe__on is open strictly for AMSA members only. Each par_cipant can submit up to 1 (one) submission for each category. All compe__on submissions must adhere to this guideline and submiZed to academics@amsainterna_onal.org with the subject “Compe__on Branch_AMSA Chapter.” All submission must be sent through the AMSA Chapter’s RC email, with each category sent in separate emails. Late submissions or submission sent from personal emails will be omiZed. Deadline for submission is before 18th May 2019 23.59 GMT+7. By submigng their work for World No Tobacco Day Compe__on, par_cipants give AMSA Interna_onal the exclusive channel without further compensa_on on the author. All decisions made by the judges are ﬁnal. All compe__on submissions must be original and any form of plagiarism is not acceptable. Any copyrighted material included in the submission requires permission from the original author or given proper cita_ons. Addi_onal ﬁle submission requirements: 1. Registra_on Form 2. LeZer of Originality 3. Author’s Agreement for Publica_on The ﬁles listed above are required to be submiZed in .PDF format along with respec_ve .zip ﬁle, one set for each submission. Scientific Paper Competition Par_cipants are invited to write a scien_ﬁc paper aimed to expand both medical students and the global community regarding the prevalence and consequences of tobacco smoking, along with its impact to the society. Par_cipants are allowed to review either their own country or the global community as a whole. The scien_ﬁc paper must involve either a quan_ta_ve or qualita_ve approach and/or research method. In selec_ng the topic, par_cipants may follow one of the sugges_ons below or create your own content as long as it is related to the theme “Recognising New Strategies to Reduce Tobacco Usage as a Step Towards a Tobacco-Free Community.” Sugges@ons 1. Iden_fy problems, problems, factors and complica_ons regarding tobacco usage and its aﬀect to members of the community. 2. Preven_ve and promo_ve measures which can be done by pa_ents, healthcare providers or the government to reduce increment of tobacco-users in the local and/or global community. 3. Management of complica_ons caused due to smoking among individuals as an eﬀort to increase overall health and their quality of life Requirements 1. One paper is wriZen by a maximum of three authors. 2. The paper must be original, without plagiarism in any form. The ar_cle must be wriZen in English. If local terminology is unavoidable, put the words in italic and provide explana_on. 3. References used must be men_oned in the bibliography put at the end of the paper. 4. References should be wriZen in Vancouver referencing style. 5. Scien_ﬁc paper allowed in this compe__on includes primary studies, literature review, systema_c review, and meta-analysis. 6. Technical requirements: a. Word Limit: 4500 words (excluding _tle, author, and bibliography) b. Font: Times New Roman, 12 c. Line spacing: 1,5 d. Margin: normal e. File format: Portable Document Format (.pdf) f. You may include graphics and/or tables whenever appropriate 7. Submission procedure: a. The scien_ﬁc paper should be compressed in a .zip ﬁle sent as an aZachment in the email along with other prerequisite ﬁles stated on the general guideline. b. Biodata of the author (full name and university) along with corresponding research _tle should be wriZen in the body of the e-mail. Please make sure that the name is correct, as the biodata will be used for iden_ﬁca_on and cer_ﬁcate crea_on. Public Poster Competition Par_cipants are invited to create a public poster aimed to reform the global community’s perspec_ve regarding the dangers of tobacco-smoking along with ac_ons available to reduce the number of both ac_ve and passive smokers. Par_cipants are required to also create an abstract describing the content of the public poster. The target of the public poster is the global community, thus solu_ons applicable globally is highly appreciated. The public poster must be based on a scien_ﬁc basis and proper cita_on is required to be stated in the poster. Par_cipants are allowed to choose any topic as long as it is related to the theme “Recognising New Strategies to Reduce Tobacco Usage as a Step Towards a Tobacco-Free Community.” Requirements 1. One poster is wriZen by a maximum of three authors. 2. The poster must be original, without plagiarism in any form. The poster must be wriZen in English. If local terminology is unavoidable, put the words in italic and provide explana_on. 3. References used must be men_oned in the bibliography put on the poster. 4. References should be wriZen in Vancouver referencing style 5. Poster’s content requirement: a. 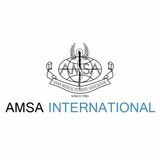 Title, AMSA Interna_onal logo, and AMSA chapter’s logo b. The word “World No Tobacco Day” c. Content d. Reference box 6. Poster’s technical requirement: a. Size: A3 b. File format: .jpg c. Orienta_on: Portrait 7. Abstract technical requirement: a. Length limit: 4 A4 pages (including _tle, graphs, and tables; excluding bibliography) b. Font: Times New Roman, 12 c. Line spacing: 1,5 space d. Margin: normal e. File format: Portable Document Format (.pdf) f. You may include graphics or table whenever appropriate. 8. Submission procedure: a. The scien_ﬁc poster and abstract should be compressed in a .zip ﬁle sent as an aZachment in the email along with other prerequisite ﬁles stated on the general guideline. b. Biodata of the author (full name and university) along with corresponding public poster _tle should be wriZen in the body of the e-mail. Please make sure that the name is correct, as the biodata will be used for iden_ﬁca_on and cer_ﬁcate crea_on.